It’s happened to everyone. You take a load of laundry down to the basement, add detergent to the well, throw your t-shirts, jeans, and socks, close the door, and then nothing happens. You press multiple buttons, but it just won’t start. So you drag your laundry to a laundromat, monopolizing your entire day. It doesn’t have to be that way. 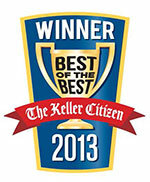 Aces Appliance & Repair provides washer and dryer repair to Keller, TX residents, allowing them to return to normalcy. We have over 20 years of experience and are familiar with all the manufacturers we deal with. Noise: Noisy washing machines can be caused by a wide variety of issues including pump motor failure, broken or damaged drive belts, transfer problems from the motor to the transmission, busted shock absorbers, and much more. Our technicians understand washing machine repair and serve Keller, TX residents well. Leaks: If you’ve noticed a leak coming from your washing machine, it could be caused by punctured or broken hoses, a damaged pump, a malfunctioning water inlet valve, a broken seal, a partially open door, or a worn tub or boot seal. Starting trouble: If the washing machine doesn’t start, the culprit could be any number of things, including the actuator, door switch and strike, timer, knob, drive motor, and main control board failures. Agitating issues: Agitator problems can be caused by a wide range of problems, including clogs, broken couplers, caps, bolts, worn belts, transmission problems, and broken timers. And much more: Washing machine problems aren’t always caused by one thing. With so many moving parts, it’s essential to call Aces Appliance & Repair to find a solution. We have over 20 years of experience performing appliance repair in Keller, TX. Aces Appliance & Repair has built a reputation for top-of-the-line dryer repair in Keller, TX. Dryer problems are caused by a myriad of issues, and we know how to get to the bottom of things. If you’re experiencing any of the following issues, give us a call. The drum spins but the dryer produces no heat: If the drum is spinning but isn’t creating heat, Aces Appliance & Repair will check the fuses, temperature switches, thermostat, heating coils, and the timer to diagnose and fix the problem. The dryer’s motor runs, but the drum doesn’t spin: If this happens, our technicians will inspect the belt, roller, motor, and idler to figure out why the drum isn’t spinning. The dryer gets too hot: We’ll make sure the dryer’s vent isn’t clogged and ensure it hasn’t developed a faulty thermostat or broken heating coils. It doesn’t work at all: If the dryer won’t turn on or respond to your commands, Aces Appliance & Repair will investigate the timer, thermostat, terminal block, and start switch. These components are usually the cause of this problem. In addition to washer and dryer repair in Keller, TX, Aces Appliance & Repair offers ice maker repair and appliance repairs of all kinds, including refrigerator repairs. To learn more, call us today. To show our appreciation for our great customers, we offer cash saving promotions! From microwaves to kitchen garbage disposals, our experts can repair it all. Need to schedule fast repairs for your home or office appliances? Give us a call today!